How Do I Remove Stubborn Pet Fur From Furniture? Pet hair is stubborn; it sticks to furnishings to the point you might think the fibers are coated with super glue or sewn into textiles. Wiping with your hand is a wasted effort; blowing's no good, either. But the hair doesn't stand a chance when you bring a few common household items to the fight. When you think of window squeegees, you probably think of cleaning windows, which is perfectly understandable. But squeegees can pull up fur that has embedded in your furniture. Gently rake the rubber strip along the fabric of your furniture, back and forth, and you'll gather plenty of stubborn hair. You can either scoop up the hair in your hands and trash it, or vacuum it up. You can purchase a squeegee specifically designed to remove pet hair, but regular window squeegees work, too. Another method is the rubber glove method. Slide a rubber glove on your hand, dampen it with water -- just damp, not soaking -- and run it along your furniture. A damp wash cloth will work better than nothing. For quick touch-ups, lint rollers will remove doggy hair. Lint rollers come in two varieties: reusable and disposable. Disposable rollers come with adhesive sheets that you simply tear off when they're full of hair. Reusable lint rollers typically either come in the form of brushes that have a textured feel and catch fabric when brushed one direction and release it when brushed the other, or as an adhesive silicone roller. Lint rollers are good for spot-cleaning, but they're not effective at removing large amounts of hair or making your couch look spotless. When other options aren't removing the most stubborn hair nestled into your furniture fabric, wheel out of the vacuum. Slide on an upholstery brush attachment that gives you greater reach and jostles the hair free, flip the switch and let the powerful machine whirr and roar as you slowly run the attachment up, down and all around your couch. To avoid fur buildup that might stymie even the most powerful sweepers, give your furniture a quick vacuuming every day or every other day. If your vacuum's not doing the job, combine the aforementioned fur-removing strategies. To prevent drastic buildup of hair in the first place, brush your pets regularly -- twice a week for short-hair breeds, daily for long-hair dogs, collecting and disposing of the loose hairs. 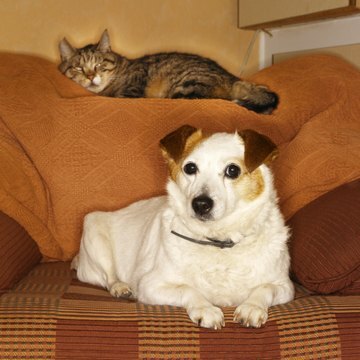 The less opportunities pet hair has to dig itself into your furniture, the less grief you'll have when cleaning. Consider using washable slipcovers, old blankets or towels to cover sofas and furniture fabric. Slipcovers are your best option because they prevent hair from ever touching your furniture. Once the protective covering of your choice is littered with hair, toss it in the washing machine.